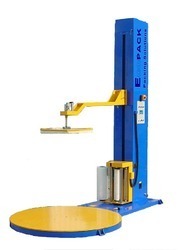 Our company has set benchmark in offering Pallet Stretch Wrapping Machine to the clients. Pallet Stretch Wrapping Machine is processed with current technology and first-class related components keeping sync with market norms. Offered range is tested on various parameters to ensure flawlessness and other unmatchable attributes. This product is able to fully eliminate different types of shrink wrapping problems which can result in the poor quality of packaging. Offered range is extensively used in various industries. This product is known for unmatchable attributes.